Already 61 years old, Michelle Yim (米雪) is the epitome of an ageless beauty. The veteran actress is still highly active in the entertainment industry and has recently been busy filming in Mainland China. Working with Hawick Lau (劉愷威) lately, Michelle was full of praises for him, noting his maturity and improved acting skills. 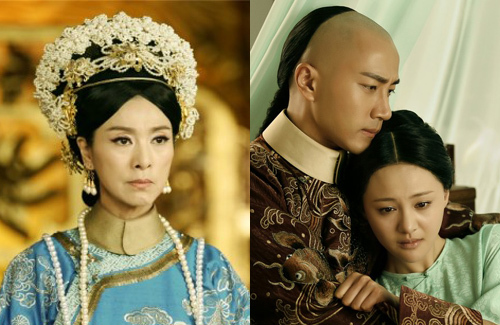 In Chronicles of Life <寂寞空庭春欲晚>, Michelle portrays Empress Dowager and also Hawick Lau’s (劉愷威) mother. Hawick’s role as Emperor Kang Xi will share a romantic storyline with Zheng Shuang (鄭爽). She is easily impressed. That man can’t move a muscle on his face. Kang Xi was raised by his grandma. It is very predictable that his PR operatves kick into high gears in the face of a publicity crisis using the familiar defensive lines like threat of lawsuit and/or we are still in love. I think the lack of movement may be due to the botox he has. He values his looks alot and have been under the knife to improve it.